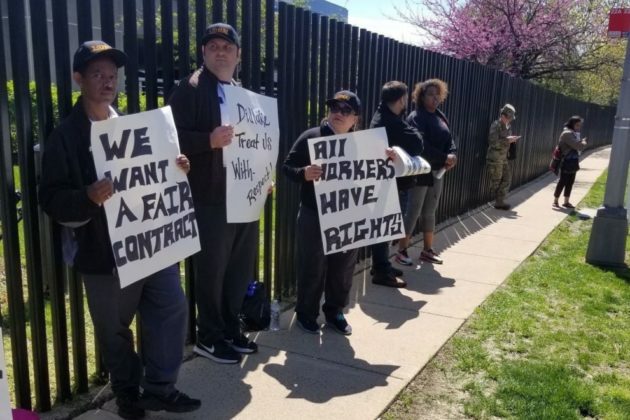 A group of workers with disabilities at the Army National Guard Readiness Center on S. George Mason Drive has gone on strike, pushing for the right to unionize and a reduction in healthcare costs. A dozen employees with Didlake, a Manassas nonprofit that contracts with the National Guard to provide maintenance and custodial services at the center, walked off the job on this past Friday. They’ve been hoping for more than a year now to organize with the help of the Laborers’ International Union of North America, commonly known as LiUNA, but Didlake has repeatedly refused to recognize their efforts and negotiate with the workers. The employees and union organizers claim that their Didlake supervisors have treated them poorly and done nothing to tamp down skyrocketing healthcare costs, a particularly troublesome development for workers who need to visit the doctor frequently to manage chronic health conditions. 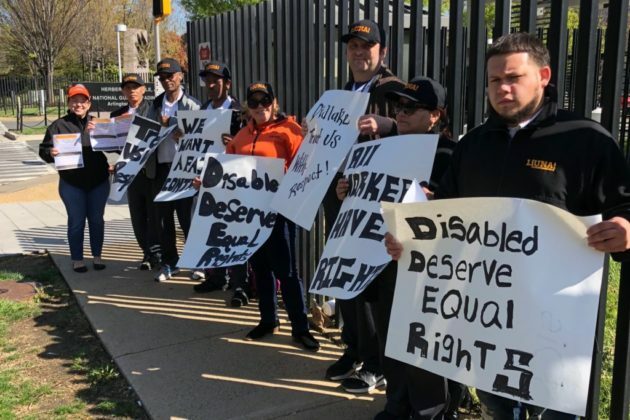 Didlake’s attorneys argue that the nonprofit only employs these workers through a federal program designed to help disabled people find work and therefore they don’t have the same ability to unionize as other employees. The dispute has found its way to the National Labor Relations Board, but Didlake employees at the site said they decided to go on strike to force more attention to the issue. A spokeswoman for Didlake didn’t immediately respond to a request for comment. But, in NLRB filings, the nonprofit’s attorneys argue that Didlake has a “primarily rehabilitative relationship” with these employees as part of the federal “AbilityOne” program, and injecting a union into the arrangement could hurt the company’s ability to offer services to its workers. “The fabric of Didlake’s rehabilitative program and the supports and services received by the participants are jeopardized and could be damaged” if the employees proceed with collective bargaining, Didlake attorneys wrote in a June 2017 NLRB filing. Yet Ulloa argues that Didlake’s response to the workers’ complaints shows that the nonprofit isn’t truly listening to their concerns. While she appreciates the job coaching services the company offers, she noted that she and her husband currently pay about $800 a month just to afford health insurance — a cost that’s barely manageable on her minimum wage salary. “The union could help us by getting us better benefits, supporting us and standing up for us,” Ulloa said. Jonathan Viera, a LiUNA organizer, says the union first heard about this dispute from one of the employees involved and has been working for months now to help the workers organize. NLRB officials have twice sided with LiUNA and ordered union elections to go forward, but Didlake has continued to appeal those rulings. 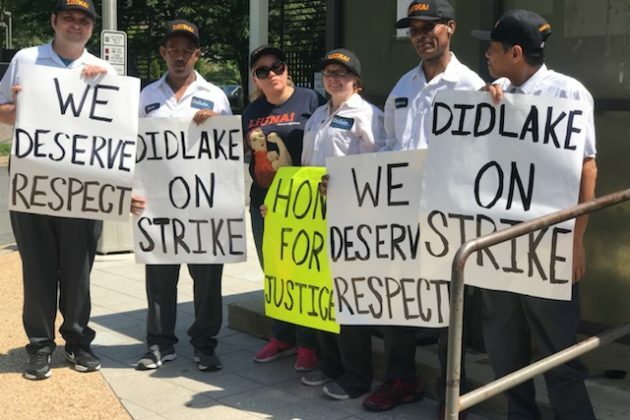 Ashley Hansen, a LiUNA spokeswoman, says there’s “no time frame” for when the NLRB’s review of Didlake’s appeal will wrap up — “It could happen tomorrow, or it could take another year,” she said. That leaves the Didlake workers in limbo, for now, which is why employees are hoping that this strike can force some sort of change. “I don’t know how long we’ll be out here,” Ulloa said.